The Innate Mind: Culture and Cognition. Edited by Peter Carruthers, Stephen Laurence, and Stephen Stich, 384pp. (Oxford University Press, 2005). 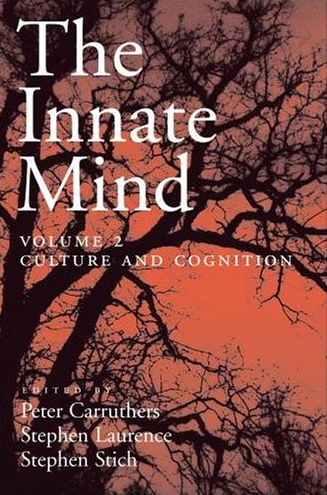 This is the second volume of a projected three-volume set on the subject of innateness, based on the AHRC Innateness and the Structure of the Mind Project. The extent to which the mind is innate is one of the central questions in the human sciences, with important implications for many surrounding debates. By bringing together the top nativist scholars in philosophy, psychology, and allied disciplines these volumes provide a comprehensive assessment of nativist thought and a definitive reference point for future nativist inquiry. The Innate Mind: Culture and Cognition concerns the interaction of culture and the innate mind, addressing such questions as: To what extent are mature cognitive capacities a reflection of particular cultures and to what extent are they a product of innate elements? How do innate elements interact with culture to achieve mature cognitive capacities? How do minds generate and shape cultures? How are cultures processed by minds? The editors have provided an introduction giving some of the background to the debates about innateness and introducing each of the subsequent essays, as well as a consolidated bibliography that will be a valuable reference resource for all those interested in this area. The volume will be of great importance to anyone interested in the interplay between culture and the innate mind. —Shaun Nichols, University of Arizona, and author of Sentimental Rules and co-author of Mindreading. Tom Simpson, Stephen Stich, Peter Carruthers, and Stephen Laurence. Introduction: Culture and the Innate Mind. Robert Boyd and Peter Richerson. Culture, Adaptation, and Innateness. Paul Rozin. About 17 (+/– 2) Potential Principles about Links between the Innate Mind and Culture: Preadaptation, Predispositions, Preferences, Pathways, and Domains. Daniel Fessler. Steps Toward an Evolutionary Psychology of a Culture Dependent Species. David Sloan Wilson. Human Groups as Adaptive Units: Toward a Permanent Consensus. Paul Griffiths. The Baldwin Effect and Genetic Assimilation: Contrasting Explanatory Foci and Gene Concepts in Two Approaches to an Evolutionary Process. David Papineau. The Baldwin Effect and Genetic Assimilation: Reply to Griffiths. Marcus Giaquinto. Mental Number Lines. Michael Siegal and Luca Surian. Modularity in Language and Theory of Mind: What is the Evidence? Dan Sperber and Lawrence Hirschfeld. Culture and Modularity. Peter M. Todd and Annerieke Heuvelink. Shaping Social Environments with Simple Recognition Heuristics. Peter Carruthers. Simple Heuristics Meet Massive Modularity. H Clark Barrett. Modularity and Design Reincarnation. Kim Sterelny. Cognitive Load and Human Decision, or, Three Ways of Rolling the Rock Uphill. Susan Dwyer. How Good Is the Linguistic Analogy? Richard Joyce. Is Human Morality Innate? Chandra Sekhar Sripada and Stephen Stich. A Framework for the Psychology of Norms. Scott Atran. Religion’s Innate Origins and Evolutionary Background.